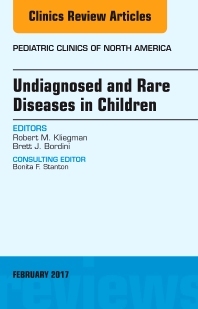 Dr. Kliegman and Dr. Bordini have written a primer on Undiagnosed and Rare Diseases in Children. Leading experts have presented the current knowledge in the following areas: How Doctor’s Think: Common Diagnostic Errors in Clinical Judgment; Team-Based Approach to Undiagnosed and Rare Diseases; Ending a Diagnostic Odyssey: Family Education Counselling and Their Response to Eventual Diagnosis; Eczema and Urticaria as Manifestations of Undiagnosed and Rare Diseases; Usual and Unusual Manifestations of Familial Hemophagocytic and Langerhans Cell Histiocytosis Syndromes; When Autistic Behavior Suggests a Disease Other than Classic Autism; Non-classic Inflammatory Bowel Disease in Young Infants; IPEX and Other Disorders; Usual and Unusual Presentation of Mitochondrial Disorders; When to Suspect Auto-inflammatory/Recurrent Fever Syndromes; Primary and Secondary Causes of Autonomic Dysfunction; Usual and Unusual Manifestations of Systemic and CNS Vasculitis; Fever of Unknown Origin; Differentiating Familial Neuropathies from Guillain-Barre Syndrome; and Munchausen by Proxy: A Factitious Undiagnosed Disease. Readers will come away with cutting-edge information to use immediately in their clinical management of patients.